Enjoy the flexability with "Fuel Flex"
Our Flex Fuel E85 upgrade systems could save you money on your fuel budget and maintenance on your vehicle. 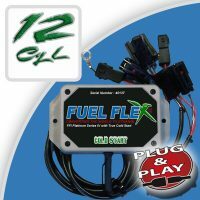 Once installed on your vehicle, you will be able to use E85 ethanol or Gasoline. Our Flex Fuel E85 upgrade systems (kits) are ready to use, all that is needed is connect the system to your injector connectors and hook up the ground wire. Drive with E85 ethanol, you could realize an average saving of 12% on your fuel budget. We do business in 46 countries around the world and have been selected as the standard for quality of ethanol upgrade systems. Once your E85 upgrade system is installed, you can refuel with E85 ethanol. However, it is best to change fuel gradually and make a full tank with 25% E85 ethanol for your first full tank. Subsequently, you can fill your tank with 50% E85, then 75% on the next and finally 100% E85 ethanol E85. This will progressively clean up your injection system and avoid potential engine operation problems during conversion. Noted that it is best to replace or clean the fuel filter after your first full 100% E85 ethanol, at least have it checked depending on the amount of miles on your vehicle.. Featured in the film "PUMP MOVIE"